Chipotle has over 1,000 locations across the country, and claims that 100% of their pork and chicken and 50% of their beef is raised humanely, without the use of antibiotics or hormones. Check out these humanitarian remarks to the Senate by founder Steve Ells; I’m impressed. They claim you can put together over 65,000 different combinations from their menu, so I’m going to offer just a few thoughts on some specific menu items. If you have any other ideas or suggestions on how to put together a healthy meal at Chipotle, please post in the comments! The biggest problem with Chipotle is the portion sizes. 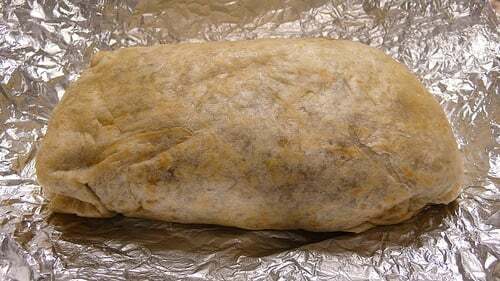 A chicken burrito with beans, rice, cheese, corn salsa, and sour cream can hit 1,030 calories! The single most caloric item in a burrito is the flour tortilla, weighing in at 290 calories (with a surprising 9 grams of fat, too). Add a side of chips (560 calories) and you’ve eaten nearly a day’s calories. So, my advice is to get a bowl instead of a burrito, skip the tortilla, and go easy on the rice. Load up that bowl with a little bit of rice, black beans, lots of fajita vegetables, and perhaps some chicken or beef (avoid the barbacoa or carnitas; they’re higher in sodium and fat). You’ll cut the calories significantly, and have a much more nutrient-dense meal. Vegans and Vegetarians, take note: Avoid the pinto beans (they’re made with bacon), and vegans may want to skip the chipotle-honey vinaigrette (they don’t say why, but I’m guessing it’s because of the honey). Both their Pinto and Black Beans are now vegan. Chipotle also notes that their cheese is made with a vegetable-based rennet, and the sour cream is 100% cultured cream. Here’s Chipotle’s list for allergens & special diets. Although higher in calories, it’s from unsaturated “good for you” fats. I’ll take guac over sour cream any day. If you get a salad, consider getting the green tomatillo salsa as a dressing rather than the vinaigrette. It’ll save you a ton of calories, fat, and sodium. Yeah, I love the cheese too. If you do get some, promise me you’ll go easy on it, okay? My husband and I love Chipotle! What we do to keep calories under control is order one burrito bowl, load it up with rice, black beans, carnitas, and a few condiments, and split it between the two of us…half the calories, all the taste, and we usually leave plenty full. You should include the Better and Worse Choice between White Rice and Brown Rice, since many Chipotle Restaurants are now serving healthier Brown Rice. I’m wondering why you put so much emphasis on saturated fat as being bad for you. Most experts any more will tell you that the recommended daily values are wrong. Your saturated fat daily intake should be tripled to about 60g, while your carb daily intake should be cut in 1/3 down to around 100G. Not all saturated fats are created equal, and I don’t vilify all saturated fat. For example, those from meat and cheese from cows fed a grain-based diet are likely to be worse for you than the saturated fat found in coconut oil. Did you see our cooking oil comparison chart? I’m very curious to know where you got your “60 grams of saturated fat” advice; that sounds exceedingly high to me. I can see that I’m going to really appreciate reading your blog. Love it! Thanks for the recommendation. Sadly, the tortilla is my favorite part. Oh, healthy eating, sometimes I despise you. I loveee your Menu Mondays!! Keep them coming pleaseee, this is such a help 🙂 I’m trying to lose weight this summer and although it is super difficult, websites like these make it a bit less painful 🙂 Could you do one for Sweet Tomatoes? Pretty please!